We had a 5.15am start this morning and took the fast boat back to Leticia. 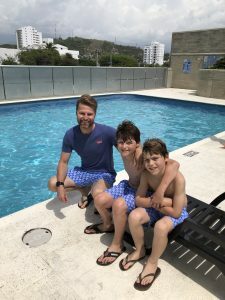 We had quite a lot of time to kill before our flight to Santa Marta, via Bogotá so we hung around at the small, very hot domestic airport for a few hours before eventually boarding the plane. Unfortunately during this time the boys came down with a fairly sever case of the runs which made the journey slightly challenging! Upon arrival in Bogotá we were very excited to see super clean, flushing loos! Jamie and I were also excited about having a glass of wine while in transit as it’s is non existent in the jungle. We hopped on the plane to Santa Marta which is only 50 minutes away. We arrived (but my bag didn’t) to a significantly more developed city than I remembered. There is now a brand new international airport which is a clear sign of how Colombia is changing. We also noticed that an international airport is currently being built in Leticia. It seems to be recognised here that modernisation and development is almost impossible to avoid and with it comes positives as well as the inevitable negatives. The question is how those negatives will be dealt with. It will be very interesting to see how increased tourism impacts on the jungle and its inhabitants in coming years. Speaking to locals, one concern they have is that it may encourage disrespectful travellers. From our experience we felt that the jungle is definitely a place that demands respect. There is also concern that indigenous cultures may be further diluted. We hopped in a cab and went to our Air BnB which was £40 per night. It was a new apartment on the 16th floor which gave us great views of the city and the Sierra Nevada. The apartment wasn’t the most exciting place as it was in a residential area in the south of the city but was just what we needed after the jungle. It was clean, had air con and most importantly given our current situation, it had two loos! The bug by this point had hit us all. We all woke up feeling fairly horrible so had a quiet morning in the flat catching up on emails etc having been off the grid for the last five days. Later in the day, and to escape the germs we took the boys for a swim in the apartment pool & had a quick walk around the town. The beach was totally packed because it was a public holiday and all of the shops and cafes were closed so we headed home, quite happy to get back to air con and clean loos! We had an early night hoping that we would all be feeling better tomorrow. We have decided to stay put for an extra night to recover and to get some much needed washing done. Monty was feeling much better this morning thank goodness but Jamie and I were still feeling pretty grim. Alfie managed to escape lightly with it luckily. We walked into the old town, well kind of, we got lost and the kids were moaning about how hot it was (to be fair, it was seriously hot) so jumped in a cab. We rehydrated in a bar on Parque de los Novios which is a really pretty little part of Santa Marta. 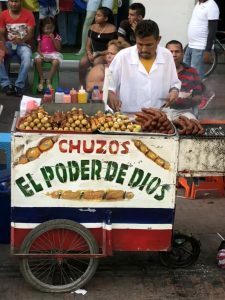 We also found FAST WI-FI so I managed to finish my Bogota travel diary blog post off and publish it. Hurrah! 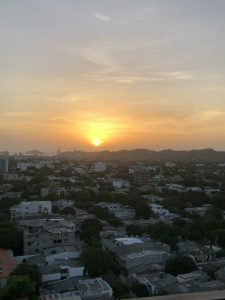 We had been warned that Santa Marta really wasn’t a place that you want to hang around in for long being a hot and busy city but actually we saw a really lovely side to it. It felt safe and laid back. If we had more time I think we may have stayed one more night in the old town. Around Parque de los Novios there was a buzzy atmosphere and lots of fab restaurants and bars. It felt authentic and I’m sure would have been a fun place to explore further. We braved lunch (having not dared eat for 24 hours) in El Bistro, a sweet little restaurant just off the park. The food was apparently delicious, I ate about two and half mushrooms which I later seriously regretted! After a late lunch, and slightly flagging we headed home so we could pack up. Tomorrow we are off to Palomino.